If you have received an acupuncture treatment from me, than most likely you have had a point on top of your head needled. Most people find this odd or even a little funny. It is one of my favorite points to use and it’s great for so many things. I practically use it with all my patients. 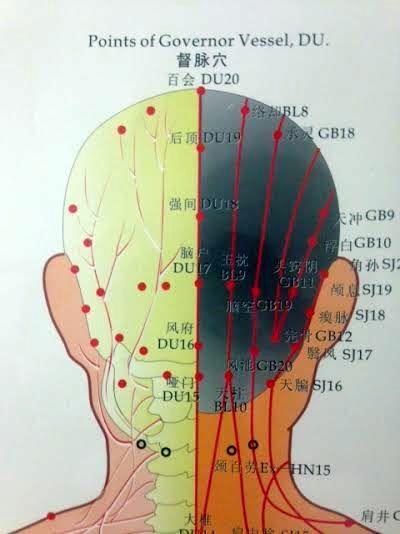 The points “name” in Chinese medicine is DU 20 or Baihui. Baihui means “one hundred meetings,” and is known to treat one hundred diseases. This point is located approximately at the vertex of the skull along the midline. If you palpate it on yourself you might feel a slight depression and it could even feel like a bruise. These are just a few conditions that DU20 can be used for but you can see why I needle it so often. So next time you tell someone you had a needle in your head, you can explain to them why.